Scented candles for Aromatherapy are becoming more common and popular day by day. Just taking the time to light a candle seems to relax many people. When the candle is scented--especially with a fragrance that is pleasing--you may find that you`re breathing more slowly and deeply. There are many Aromatherapy candles for different mood elevations in the market. They can be relaxing, rejuvenating, helpful in meditation, calming, anti stress and even aphrodisiac. 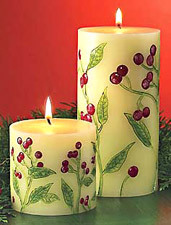 Aromatherapy candles are widely available in stores. ·	Fan Diffusers- small fans blow air through pad containing essential oils - uses no heat. ·	Nebulizing Diffusers- pumps air through glass chamber filled with essential oils - uses no heat (the aroma therapists choice - many sizes to choose from plus timers that save essential oils). ·	Tea Candle Diffusers - fill reservoir with water and add a few drops of essential oils. ·	Lamp Ring Diffusers - place on low voltage bulb and add your favourite aroma oils. ·	Car Diffusers- Add essential oils and plug into cigarette lighter of your car or truck. ·	Aromatherapy Inhalers- two great choices, an attractive metal aromatherapy inhaler or a simple plastic inhaler. ·	Diffuser Pots - add essential oils to glazed pot and enjoy aroma for days - uses no heat. ·	Special Purpose Diffusers - Aroma inhalers fit discretely in nasal passages - uses no heat. ·	Necklace Diffusers - hand blown glass ceramic vials with sterling silver necklaces - uses no heat. Body warmth does the sufficient trick. Comes as a handy accessory as well.
. Aromatherapy Electric Diffusers- are specially made electric equipment to create a scented environ, with scents and their intensity set according to your own choice. You place the oil or substance in the bowl and light a candle that goes in the slot below it. As the bowl heats by the flame of the candle, the oil or other substance begins to burn and the smoke begins to rise, causing a natural incense burner. 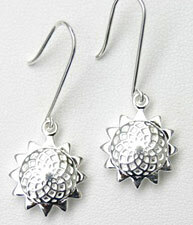 These are usually very decorative, and can be gifted as an Aromatherapy Gift to your near and dear ones. 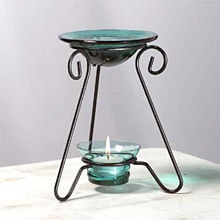 Aromatherapy oil burners also work on the same principle. Highly elegant, they are available in Gift shops. Aromatherapy pillows are convenient replacement for old heating bags and messy gel packs. They are widely utilized to heal Migraine, Headaches, Muscle Aches, Back & Neck Pain, Sports Injuries, Arthritis Rheumatism, Bursitis Carpal Tunnel, Insomnia, Depression, Stress, Colds, Flu and Menstrual Cramps. These pillows can be treated in microwave oven, or freezer accordingly to use them as hot or cold packs. 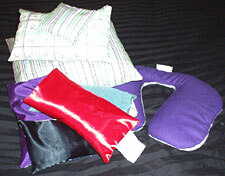 Eye pillows are also made to sooth eyes or to induce sleep. Aromatic jewellery (also known as Aromatherapy Jewellery) are the elegant looking neckpieces, pendants, bracelets rings and earrings, that incorporate either a pad drenched with aroma oils within themselves, or a small vial slot in within. The person wearing this is under the fragrant influence wherever he/ she goes. Merging Aromatherapy with elegance of Jewellery, these are catching up with imagination and fashion or millions of people each day. Pleasant aromas have the power to alter our mood, so it is not surprising that the practice of using scent imaginatively in the home is centuries old. One ancient and delicious way to do this is with potpourri. The word "potpourri" means a medley of things--exotic blends of herbs, spices, and dried flowers set out in pots or jars to scent the surroundings. The idea is still a charming one, and it`s so easy to use fragrant all-natural potpourris that can actually make a positive difference, improving the atmosphere in our homes on every level, relaxing us, helping us to feel more clarity and calm. Pot Pourris are readily available for various mood enhancements, or they can be made at home. To soften nails cuticles, calluses and corns, before Pedicure / Manicure. Removal of make-up / foundation. Aids in giving a clean shave. ·	Loofah scrubber beautifully arranged in a fancy cane basket. Dimensions: 10 * 5 inches. Good for body pain, headache and different kinds of physical fatigue. Sachet - (10 gms of fragrant potpourri). Apart from this, there are many natural aromatherapy skin care products available in the market in the form of aromatherapy masks, scrub, moisturizers and creams. Essential oils are usually utilized directly in bath water. 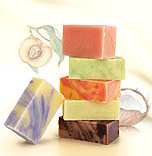 Aromatherapy soaps are also being manufactured for the same purpose and more convenience. Aromatic bath soaps can be utilized to enhance the fragrance factor, or more like herbal soap, they can also be used for overall well-being and medication. Different essences and vegetable oils are mixed together for the desired purpose. 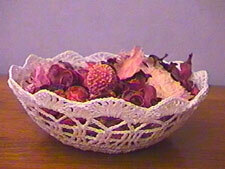 Usually handmade, they are commonly sold as aromatherapy bath products in shops. For the multipurpose goal of mixing bath with medication, essential oils are blended with bath salts to get one`s own Aromatherapy Spa treatment. Right amount of chosen essential oils are mixed with bath salts and dried herbs, for a specific medication. Apart from that, many harmless therapeutic chemicals like hydrogen peroxide, sodium bicarbonate and citric acids are also mixed.